Singer-songwriter Edna Vazquez joins the Portland Jazz Composers Ensemble in a series of concerts and workshops in February 2018. In this interview with PJCE Executive Director Douglas Detrick, hear how she was first introduced to jazz in Mexico, and what the “two different universes” of jazz and mariachi have in common. [Doug] Welcome to Beyond Category, from the Portland Jazz Composers Ensemble. I’m Douglas Detrick. 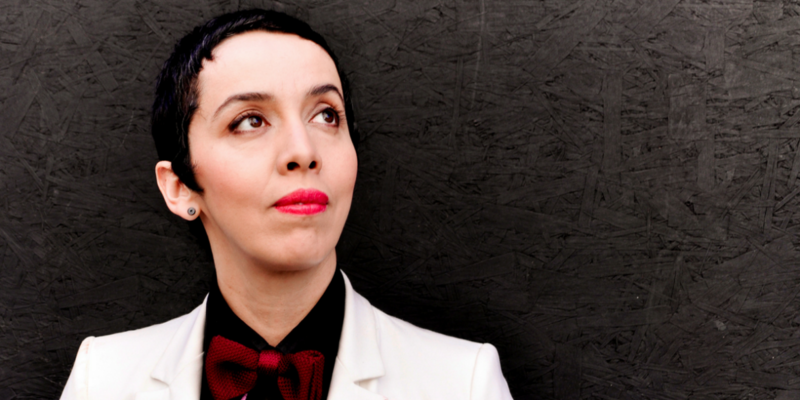 That was Portland singer/songwriter Edna Vàzquez talking about jazz and mariachi music. Edna’s foundation is in mariachi, but her original songs combine elements of jazz, rock, and a wide variety of Latin American styles. She joins the PJCE’s 12-piece jazz ensemble February 15th at the Old Church in Portland, February 16 at Mt Hood Community College in Gresham, and February 17th at the Columbia Center for the Arts in Hood River. If you get your ticket before they all sell out, you’ll hear the incredible passion she brings to every performance. Her energy is unforgettable, and even if you don’t speak Spanish, you’ll understand every word. I spoke with Edna about our collaboration, her own history in Portland, and what about jazz is exciting to her. Don’t miss this one, folks. Even if you’ve never listened to mariachi, or if you’ve never listened to jazz, you’re going to hear something that you’ll love at these concerts. We’re thankful to our partners the Oregon Cultural Trust, PDX Jazz, the Latino Network, and the sponsors of the PJCE’s 10th Anniversary Season, Audix Microphones. Head on over to pjce.org to learn more about these concerts, to buy your tickets, and if you really love what we do and you want to support us even more, you can become a PJCE Sustainer, making a tax-deductible contribution of as little as $5 a month. This has been Beyond Category, the podcast of the Portland Jazz Composers Ensemble. I’m Douglas Detrick, Executive Director and Podcaster-in-Chief.